Per manufacturer’s restrictions, Shoei products can only be shipped to addresses in the 50 US states. $38 Promotional Gift Card available on this product! 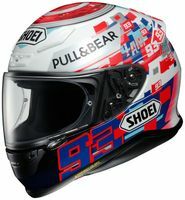 Please take a look at this sizing information supplied by Shoei. Standard replacement shield for RF-1200 and RF-SR Helmets; Also fits X-14 (see note below).